All Things Brantley, All Things Tribe: Vote Brantley for MLB's 2018 All Star Game! hello, Michael Brantley fans! 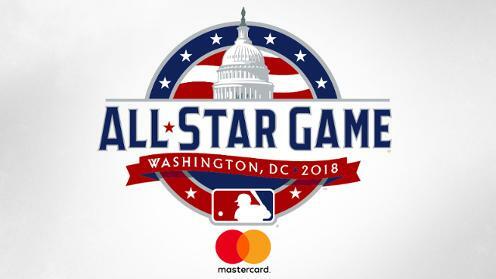 get ready to input those captcha codes because it's time to once again vote for your 2018 MLB All Stars!⭐ the location for this year's game is Washington, D.C.! what better way for Dr. Smooth to spend his final campaign as an Indian than by sending him to the MLB All Star Game one more time to represent Cleveland? to this point in the season, Michael is currently batting .337 (62-for-184), the highest average on the team among qualifying players, with 22 extra base hits, including 12 doubles, a co-team high one triple, and nine home runs (two of which were grand slams, the former being his first career grand slam) in 45 games. he also has 36 RBI, 31 runs, 13 walks, two hit by pitches, two stolen bases, and 103 total bases while striking out 18 times in 201 plate appearances. several of these stats rank in the Top 10 among American League left fielders as well. at the conclusion of May, Michael is 1st with his .337 batting average and .383 OBP; 2nd with .560 SLG and .943 OPS; 4th with 62 hits, 36 RBI, and 103 total bases; tied for 5th with 12 doubles, nine home runs, and two sac flies; tied for 6th with 22 extra base hits; 7th with 31 runs; tied for 7th with one triple; 9th with 184 at bats; tied for 9th with two hit by pitches; and 10th with 201 plate appearances. besides that, out of 15 qualifiers, he has the least amount of strikeouts with 18. Michael, who began the year on the 10-Day DL as he continued to build up endurance following his October 2017 right ankle surgery, received supplemental days off upon his return in April. therefore, he hasn't played in as many games as all the other regular ballplayers and that's why some of his numbers maybe aren't where you might expect them to be. but, just like in his previous rehabs, Michael worked diligently to get back on the field and he's demonstrated that an injury cannot and will not keep him down. Michael doesn't look like he's missed a beat since being activated from the disabled list on April 6. he's been the club's most consistent hitter to date, hitting in 37 games and reaching base in 41 of his 45 total. he put together a little 7-game hitting streak from April 11-22 and then went on a tremendous 19-game hitting streak between May 9-30, in which he bat .366. right now he also has an active 21-game on-base streak. furthermore, Michael matched a career high with five consecutive multi-hit games from April 11-20. had he struggled right out of the gate like numerous teammates of his did to start their seasons, it would have been easy to assume it was because he needed more reps to find his timing at the plate. luckily, Michael was ready to go from the jump. on the contrary, he has been dealing with a different type of challenge this year after being moved around in the lineup. first, he was inserted in the 4th and 5th spots, depending on whether a right- or left-handed pitcher was starting. manager Terry Francona decided to drop Michael from his best career BOP (3rd) down to one of his worst (cleanup) to accommodate Jose Ramirez. that didn't last too long though because after six weeks of Jason Kipnis struggling in the 2 hole, Tito demoted Kip and moved Michael up to 2nd as of May 11. so it's even more impressive that Michael continues to hit while going through these BOP adjustments. now if we're going to look at Michael's numbers when compared with all AL OFs, then they don't rank as high and, unfortunately, that could put him at a disadvantage when voters are scanning all the outfielders' stats. but again, that's not the result of a lack of effort or good swings. he missed nine games in March/April between his DL stint and extra rest days. it's evident he lost out on some opportunities to pad his stats and get higher up in the rankings and he shouldn't be penalized for that. based on what Michael's done thus far, i think it's a fair request that fans have faith that he will keep playing at a high level. as long as he remains healthy, i'm confident Michael's bat is only going to heat up further (along with the weather) throughout June. and then he will build an even stronger case to warrant the honor of being named a 2018 All Star. note: in 2017, voting opened on May 1, so i was wondering what the heck they were waiting for to get this underway. fans have three less weeks to vote this year; don't delay! now i will explain the two ways you can vote. 1. VOTING ONLINE. to vote through the All Star ballot* online, you need a valid email address. using your computer, tablet, or smartphone, you can then cast 5 votes per 24 hours. that's the maximum allowed per day; however, you're allotted 35 total votes per email address. so in order to utilize all your votes, you'll have to visit the site on a daily basis for a whole week. TO VOTE ONLINE FOR MICHAEL TO MAKE THE 2018 AMERICAN LEAGUE ALL STAR TEAM, CLICK HERE. *if you'd prefer to translate the ballot to Spanish, hit "Español" in the upper left-hand corner of the page. 2. VOTING WITH AN APP. the other voting method is limited to using your smartphone or tablet. to vote with the MLB.com At Bat app or Ballpark mobile app, you'll first need to download it. then log into the app to gain access to the ballot. again, a valid email address is required and you can only vote 5 times a day per email. PRO TIP: want to vote more than 5 times a day/35 times total? well, you can and it's really easy! just make sure you vote with every email address you have. think about all the email accounts you've created since the internet came into existence. are you currently using gmail or yahoo? do you have an old hotmail or perhaps an AOL* email from the 90s? what about an email account from school or work? use them all! start out by voting 5 times with one address. then, once you've hit your maximum 5 daily votes with one email, simply fill out a new ballot. when it comes time to submit your selections, enter a different email address to cast another set of 5 votes! BUT if you are using multiple emails to vote, you may want to keep track of them so you remember to vote 35 times with every address. *btw, if you weren't an AOL member but used instant messenger back in the day, any AIM screen name you had comes with an email address. just put @aim.com after your screen name and that's a valid email account. if you're like me, you probably had a few different SNs, so definitely use those to vote, too! because i have voted A LOT over the past five years, i've picked up on some things that voters ought to be on the look out for and beware of during the voting process. so i'm going to share them in hopes that everyone votes the proper way, exercises all their votes, and executes a backup plan in case an unexpected restriction pops up (like in 2016). maybe the best assurance that you've fulfilled your daily quota is to check your email after you vote because, if you did everything right, you'll have a confirmation message from MLB.com in your inbox. it will state that you've voted the maximum five times over the past 24 hours and inform you how many times you have voted overall so far. in addition, when you have voted 35 times, you should receive a Thank You for Voting, "you have voted the maximum of 35 times" message from MLB.com. *two years ago, after you had cast your final 5 votes with your email address and totaled 35 votes, a different notification would pop up that said, "congratulations! you have voted 35 times from this email address." this did not materialize in 2017, but i'm hoping it returns this year because that's another quick way to guarantee you've used all your available votes for one particular email. 2. this one might sound obvious, but STOP voting with an email address after you've voted with it for seven days/35 times. from a past personal experience, i know that if you try to cast more than 35 votes with the same email, those votes will go through. nothing will pop up to alert you that you've already voted the maximum amount. so the big question is, do those votes count or are they invalid, just like if you vote too many times within 24 hours? if i had to guess, they don't count and if you try this, all you'll be doing is wasting your time. again, be cognizant of how much you've voted and don't do any more work than you have to because it likely won't help your favorite player(s). if you want to vote more than 35 times, vote with multiple emails as i explained above in the Two Ways To Vote section. 3. if you're going to vote with more than one email address, there is something you need to keep in mind. in 2016, after All Star voting had been open for about a month, you were no longer permitted to vote with multiple emails in the same web browser--you had to use a different browser for every email you wanted to vote with per day. this was not an issue last year and i didn't have any problems today either when voting with several different emails in Firefox. but should this complication present itself later on down the road, like in late June, you'll have to assign one email address per web browser. i promise though, it's a quick fix. plenty of free browsers exist that are easy to download even if technology is not your thing. i have four on my laptop--Mozilla Firefox, Google Chrome, Microsoft Edge, and Safari. other common ones include Internet Explorer, Lynx, and Opera, and newer options Brave and Vivaldi. if you need any extras, simply do a search for free web browsers, pick the one you want*, download it, and then install it. depending on your internet speed, it won't take more than a couple minutes. *some browsers do work better with a PC than a Mac and vice versa. should any of these three things i discussed here change, i will update you in the All Star Voting Results section of my Brantley's #s Through June blog and on my twitter account @clevelandgirl23. ballot results have generally been revealed weekly, beginning about four weeks after voting commences. but with the late voting date and less total weeks to vote this year, it's unclear if/how they're going to put the results out there. ordinarily what happens is, each week the Top 15 outfielders are unveiled (while the other position players only contain a Top 5). after fan voting is over and all the votes have been calculated, the three outfielders with the highest number of votes, no matter which specific OF position they play, are awarded starting spots in the All Star Game. then three additional OFs will be chosen as reserve players, as determined by the players' votes. their Top 3 OFs, who aren't already starters, get the nod. even so, typically the reserves do tend to come from the other Top 15 OFs that the fans voted for. every year i always point out how it's significantly harder for an outfielder to get selected to the All Star Game because they are in direct competition with players from THREE positions overall--left, center, and right. i think it's unfair to group all the OFs together like that and it's a serious obstacle for Michael. normally, he has some of the premier stats when compared to the rest of the AL left fielders and odds are he'd have started several past All Star Games if he was only up against LF players. i understand that a good deal of outfielders these days play multiple or all OF positions and can be considered somewhat "interchangeable," but i still don't care for the voting conditions of this particular category. so please vote for Michael as much as you can and encourage everyone you know to vote for Dr. Smooth, too! as the ballot updates are publicized online--if they are, that is--i'll be noting the progressions/regressions that Michael is making each week and reporting not only his rankings on my twitter @clevelandgirl23, but also the number of votes he gained and how far he is from landing a starting spot. i'll be chronicling the changes in the Top 15 outfielder lists in my next cumulative Brantley blog as well. we'll find out who made the cut shortly after voting concludes. the AL and NL starters and reserves are usually announced a week ahead of the last game before the All Star Break during ESPN's All Star Selection Show at 7:00 pm ET. this year, it looks like that'll be on Sunday, July 8.
if i'm being perfectly honest, i think the starting OFs are probably already set. when the New York Yankees acquired Giancarlo Stanton during the offseason, my first reaction was, "well, the 2018 ASG outfield starters are gonna be Mike Trout, Aaron Judge, and Stanton." i didn't think anybody else had much of a chance. fortunately, Stanton is listed as a designated hitter on the ballot, so that leaves one starting spot open. still, there are other candidates who i suspect will place in front of Michael in the voting. George Springer, Mookie Betts, Mitch Haniger, and Justin Upton are all having excellent seasons and should receive a lot of votes. J.D. Martinez is doing great, too, but thankfully he's another one who was classified as a DH. nevertheless, Michael will be lucky to come in 5th. bottom line, Tribe fans are going to need to "stuff the ballot box" with votes for Brant to give him an opportunity to start in the Midsummer Classic. 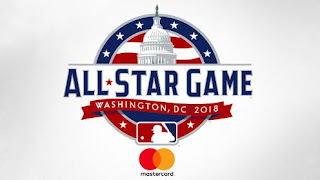 the 89th annual All Star Game will take place in Washington, D.C., at Nationals Park on Tuesday, July 17. if you're in the US, you can watch it on FOX. if you're in Canada, you can tune in on Rogers Sportsnet and RDS. the game starts promptly at 8:00 pm ET with pregame festivities beginning at 7:30 pm ET.